In recognition of National Disability Employment Awareness Month, the West Virginia Division of Rehabilitation Services has sponsored an art exhibit featuring 47 West Virginia artists. 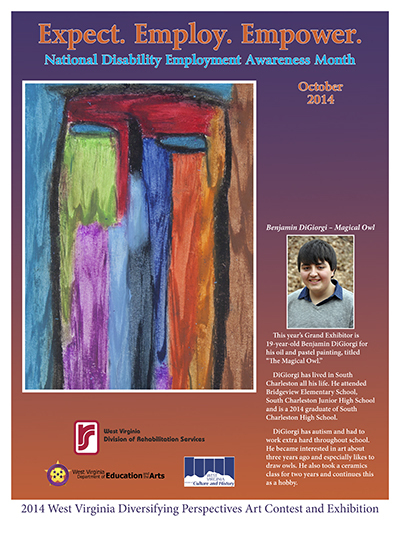 The 2014 Diversifying Perspectives Art Contest and Exhibition opened Sept. 16 in the Balcony Gallery of the Culture Center at the State Capitol Complex in Charleston. Award winners and their works are named in this news release dated Sept. 16. October is National Disability Employment Awareness Month, calling attention to disability employment issues and celebrating the many and varied contributions of American workers with disabilities. This year's theme is "Expect. Employ. Empower." The exhibit will remain in the Balcony Gallery throughout October. A catalog of the exhibit is available for download here. You may request a free commemorative poster of the exhibition from Tracy Carr, or by phone at 800-642-8207. Supplies are limited. This contest and exhibition were made possible with the kind cooperation of the West Virginia Division of Culture and History and the Office of the Secretary, West Virginia Department of Education and the Arts.